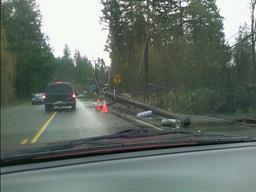 As promised, here are a bunch of pictures taken with my camera-phone on Friday morning, after the wind storm Thursday. I’m at work, so I have a bit of bandwidth, and a chance to try out the photo gallery tools on Fastmail.fm — simple but they work well for my purposes. So we decided to go to Vancouver, BC at least till Sunday. Or I could just call the house and see if the answering machine picks up.